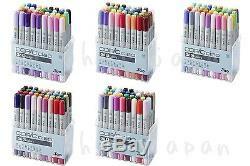 Too Copic Ciao 36 Colors A / B / C / D /E : 12 /24 Colors set from Japan. Design / illustration / manga Painting / Craft Hobby Ciao 36 Colors A set This is a beginner's introductory set for drawing a marker illustrations. Moderately equipped with the color of each hue, so there is no hesitation in color chosen. Ciao 36 Colors B set After a little familiar with the illustrations production of COPIC an introductory A set, This is a set that is aligned then want become color. Ciao 36 Colors C set As you become familiar with 36A + 36B set, This is a set that align the color of a little will want lighter. Ciao 36 Colors D set As you become familiar with 36A + 36B set, This is a set that align the color of a little will want darker. Ciao 36 Colors E set If you get used to the Chao 144 colors, it is a set you have aligned the color increasingly want. Ciao 180 Colors ALL set (With extra bonus) The set includes: Copic Chao 72 colors A set, 72 colors B set, Chao 36 colors E set , A total of 180 colors Bonus : Pen for Highlight & Effect " Copic OPAQUE WHITE with built in fine brush 7ml x1 " will also be attach as a benefit. Except for South America and Africa. -------------------------------------- Production limited number of goods ------------------------------------ Ciao Start 24 colors with coloring set Limited edition From the Copic Chao all 180 colors, Carefully selected 24 colors of each hue and housed in genuine plastic case for 36 colors, Using the technique guide, Line art for Copic Multi Liner 3 colors, It was a set of immediately enjoy paint picture and paint the way guide, It is a special set of production a limited number. Of course, it is OK also choose more of the same color. Please select from the following color. Please give an order separately. It is a set of basic color of the primary color system are met. It is set for illustration applications including portrait. Color that you are looking at the monitor might be incorrect. Because, colors that can be represented by a monitor is different. Be sure, please check the color of the model number. Too Copic Ciao Made in Japan Ink ingredients: alcohol dye ink Twin nib (Super Brush and Medium Broad) If you are a necessary spare nibs, Please ask! Item arrival is different depending on the location and country, it is about 2 4weeks. Note: To Buyers in Germany , Italy , Indonesia , Mexico. Please ask to us correctly. Romania , Bulgaria, Cyprus, Korea, Vietnam, Qatar, etc. International Buyers - Please Note. We do not mark merchandise values below value or mark items as "gifts" - US and International government regulations prohibit such behavior. The item "Genuine Too Copic Ciao 36 Colors A / B / C / D /E 12 /24 Colors set from Japan" is in sale since Thursday, July 02, 2015. This item is in the category "Crafts\Art Supplies\Drawing & Lettering Supplies\Art Pens & Markers". The seller is "holoholojapan" and is located in JAPAN.